I know you guys had to wait for this a little, but here it finally is: the first part of my Bali Travel Diary. Keep reading to see more pictures of our adventure and to find out what we have been up to so far. We started our adventure in Seminyak, as it is located relatively close to Denpasar airport, and as we just wanted to have a few days of relaxation somewhere close to the beach before commencing our travels on the island, we decided that this was the place to start. If you are looking to visit Bali I would definitely recommend the Seminyak area over Kuta, as it is way less touristy. During that first week we moved accommodation three times, either because we weren’t happy with it or because it was fully booked for the upcoming nights. That together with the time it took to “get used” to the area, kept us busy for the first couple of days. During that time we mostly went to the beach and we also took a Surfing Class. After two days or so we finally rented a scooter, which was a game changer. We no longer had to rely on taxis and the scooter was way cheaper anyway! With the scooter we then decided to explore Uluwatu a little. It took us about an hour to get there and the first thing we did was have lunch at “Cashew Tree” which I can only recommend you to check out. They have a couple of super tasty vegan options. After that we went to Bingin Beach, which was pretty nice, but you couldn’t really go swimming there, due to all the corals (it is more of a surf spot anyway) so it is definitely not my favourite beach on Bali. After that we also wanted to drive to the temple by the cliff in Uluwatu, but the road there was very bad and it was already getting dark, so we decided to stay on the safe side and drive back to Seminyak instead. My birthday weekend which happened to be the first weekend of our first week in Bali, we spent at the Hard Rock Hotel in Kuta (you can read more about it here) and on the day of my birthday we went to the Potato Head Beach club (see more of that here) which was super fun! Food wise we have religiously been visiting the same restaurants in Seminyak. For dinner we ended up going “Earth Cafe” most of the time, which is a Vegan Restaurant and minimarket with an extensive menu. We haven’t tried out everything there yet, but our favourites so far are: Papaya salad, unwind & relax smoothie, hola mexico tacos and the seaweed. Other than that we have also been loving Nalu Bowls, which offer super delicious smoothie bowls! My favourite one by far is the “J-Bay” peanut butter banana bowl. Generally, there are a lot of vegan places on Bali, especially in Ubud where we went after Seminyak. 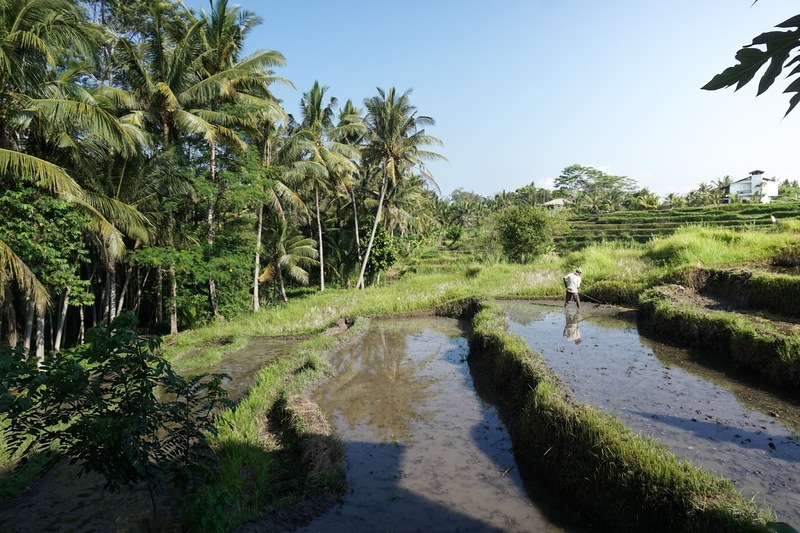 Our second week in Bali we spent exploring Ubud and the Gili Islands! First of all we stayed in Ubud from Sunday until Wednesday, where we had a look at the breath taking rice terraces, the monkey forest and the Lotus temple. I think my favourite was the monkeys though, as they were super hilarious! During that time we slept at an Air BnB place, which was right by a rice field, so the view from our balcony was very unique. Ubud is very different from the tourist packed Kuta. It is full of cultural heritage, Yoga studios and Hippies walking the streets. We did however miss the ocean, so we were very happy to head to the Gili Islands after our time in Ubud. There are three Gili Islands: Gili Air, Gili Trawagan and Gili Meno. The latter was supposed to be the one with the most beautiful beaches and the least tourists, so we decided to go there for two nights. I have got a blogpost coming up where I will share with you more about our stay there, but for now let me just say that much: It was absolutely beautiful! I love those little monkeys Jolie. Fun times around Bali, and Ubud in particular. Loving these snaps. Tweeted for you.